As a business owner, you know that first impressions are a crucial part in drawing in potential customers. What does the appearance of your parking lot say about your business? Is it clean, free of cracks and potholes? You should consider the appearance of your business's parking lot important and look at the FAQs about asphalt parking lot paving. There are many different benefits of using asphalt to pave your parking lot. Asphalt is very durable and will last many years through high volume traffic. Asphalt parking lots that are constructed properly last significantly longer than alternative pavements. Also, it costs less to install than other alternatives and is even recyclable! How long do asphalt parking lots typically last? If your parking lot is installed properly by an experienced asphalt contractor, and has regularly scheduled maintenance appointments, it generally should last between 20-30 years. There are many factors that can affect a parking lots life, such as weather conditions, quality of installation, stability of the sub-grade, the drainage plan and usage. Be sure to schedule regular preventative maintenance to keep your surface long lasting. Is there a time of year that is better to install an asphalt parking lot? An asphalt parking lot paving company can usually install all year round if the temperature and ground conditions permit. Paving operations can be weather dependent due to moisture and freezing of the ground. If it is heavily raining or snowing, your asphalt contractor will normally reschedule the project to a dry and warmer day. What are the types of ongoing maintenance I should expect on an asphalt parking lot? Sealing cracks, pothole repair, seal-coating, patching, and re-striping are typically the types of maintenance repairs you will need to do for your asphalt parking lot. Should I put a seal-coating on my parking lot? Generally, it is recommend that asphalt parking lots have a sealcoat application put on. Seal-coating is a thin layer that is added over your paved surface. The sealer protects damages caused by rain, snow, UV rays, and fluids from vehicles. Your lot should be re-sealed every few years to slow down the deterioration process. When should my parking lot be resurfaced? You can tell your parking lot may need to be resurfaced when it has become heavily oxidized but the base is in stable condition. The condition of your lot can be tested by an asphalt paving company to see what type of shape it is in. How long after paving a parking lot can it be driven on? There should not be any foot or vehicle traffic on your freshly paved parking lot for at least 24 hours. We hope you think of the importance of your business's parking lot and consider asphalt paving when you need to resurface your lot. 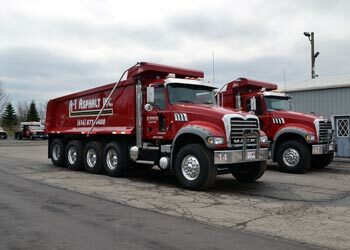 If you have any questions about asphalt paving, or are in need of service contact Grand Rapids asphalt parking lot contractor today.